Most Founders and CEOs start or join their companies with an idea or dream of what they want to create. They often struggle, however, with the Visioning process and how to make their Vision come to life and become the touchstone that drives performance for their organization. In this eBook, we will help you articulate a well-defined picture of where you are going in order to provide your organization with a roadmap to the future you want to create and also set the tone for the culture of your company. 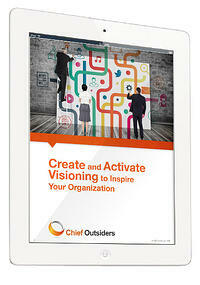 Download Tom McCrary's eBook, “Create and Activate Visioning to Inspire Your Organization,” to help define your Vision and drive your organization toward your chosen future. Feel free to contact Tom directly at TMcCrary@ChiefOutsiders.com if you have any questions or want more information.